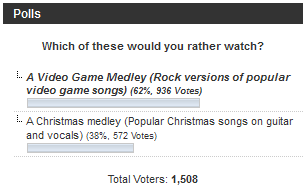 I’m so happy that you’ll be doing a Christmas medley after all! And I think it will be really amazing with lots of intricacies and many instruments – you are so talented with this, it’ll be a joy to see (and a lovely Christmas present for your fans). Speaking of Christmas, I hope there will be some shop discounts around that time too. ^^ I have a few gifts in particular in mind. . .